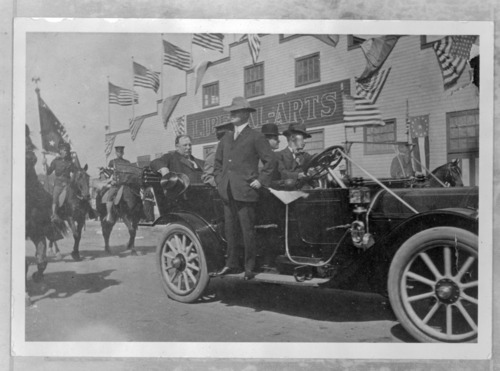 This black and white photograph shows the twenty-seventh President of the United States William Howard Taft in Hutchinson, Kansas. The president was the keynote speaker at the state fair to celebrate the fiftieth anniversary of Kansas being admitted to the union. President Taft is sitting in the back of the car with a top hat in his hand. The photograph was taken in front of the Liberal Arts building.